Looking for a wedding ring with a unique architectural flair to suit your contemporary groom? 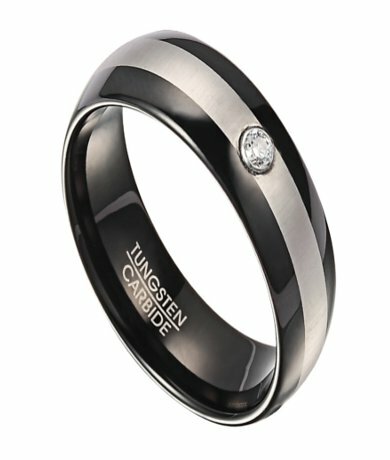 Look no further than our black tungsten wedding band with satin finish center and cubic zirconia. Feast your eyes on a sophisticated crystalline epicenter secured in a bezel setting. This 8mm black tungsten wedding band with satin finish center and cubic zirconia also features gleaming ion-plated edges in midnight black with a permanent polish that requires minimal maintenance over time. Better yet, this dazzling alternative to titanium offers the perfect amount of heft, keeps its finish forever, and resists scratches better than any other metal. With this designer ring, your groom can instantly elevate his look to achieve a cool sophistication for work or play with the added benefit of bling! Our black tungsten wedding band with satin finish center and cubic zirconia is striking from every angle. Inspired by the Art Deco movement, we designed this ring to represent the cutting edge in men’s fashion and jewelry. Each 8mm black tungsten wedding band with satin finish center and cubic zirconia features a comfort fit design, so it’s easy to wear all day long. Comfort fit tungsten rings usually run 1/2 size larger, it is suggested you buy a half size smaller than your standard ring size. We recommend having your finger measured for a comfort fit ring at your local jewelry store for an accurate fit. All of our tungsten rings come with a lifetime warranty. The ring came fast. Beautiful quality. Cant wait to give it to my guy!